Published on August 2, 2010 in Africa, Culture, General T&T, People's Partnership, Politics, Protest, Race and Identity and USA. 1 Comment Tags: Africa, African, Emancipation, Emancipation Day, ESC, Kafra Kambon, Kamla Persad-Bissessar, Keith Rowley, Wade Mark, Winston Peters. 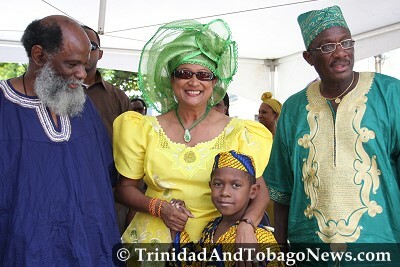 PRIME MINISTER Kamla Persad-Bissessar yesterday urged the nation to not only see Emancipation Day as merely a public holiday but rather to reflect on the struggles of the ancestors of Afro-Trinbagonians who rose up from the chattel of slavery to take their rightful place in a free society. Mr DJ, run the track! PRIME MINISTER Kamla Persad-Bissessar made waves at Emancipation Day celebrations at the Jean Pierre Complex, Port-of-Spain, singing Bob Marley songs, acting as MC/DJ and launching what can only be described as a charm offensive. 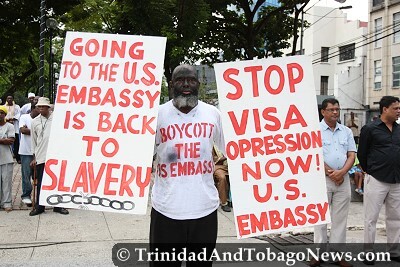 THE United States Embassy should give citizens of this country a better explanation for denying them visas, Minister of Sport and Youth Affairs Anil Roberts said yesterday. DRAPED in dashikis, kaftans and agbadas of all colours and sizes, men and women braved the early morning sun yesterday to witness the re-enactment of the declaration of Emancipation. The Tobago Heritage Festival culminated yesterday with Emancipation Day celebrations along the streets of Bon Accord in Tobago, to the Pigeon Point Heritage Park. Is your mind free or that of a slave? “IS YOUR state of mind that of a free man or a slave?” Chief Secretary of the Tobago House of Assembly (THA) Orville London asked Tobagonians yesterday at Emancipation Day celebrations at Pigeon Point. During the recent general election campaign, at the time when Mr Manning was seeking to insult and belittle Makandal Daaga, a younger colleague of mine at work asked me who Daaga was and what was his story. Barely able to hide my astonishment that he did not know I tried to piece together for him a brief summation of the events of 1970 and Daaga’s role in those events. SURINAME’S Ambassador to Trinidad and Tobago Fidelia Graand-Galon believes there is a cultural connection between both countries. Speaking on the weekend at the Emancipation Village at the Jean Pierre Complex, the Ambassador expressed delight in participating in this country’s observance of Emancipation Day. RAMBERT village, a small village on the outskirts of San Fernando has a history that includes the Scottish and French occupation of the Naparimas during the 18th century. 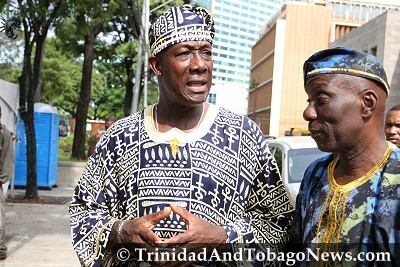 “August is the country’s symbolic freedom month because so many significant events happened in this month,” Opposition Leader Dr Keith Rowley said in his Emancipation Day message. Today’s celebration of Emancipation Day will take on a virtual national flavour, bolstered by $2.7 million in grants from the People’s Partnership Government, a tacit recognition of the importance of the day to the descendants of freed African slaves. Today, August 1, 2010 is Emancipation, the day on which chattel slavery finally ended in Trinidad and Tobago, the English-speaking Caribbean and other countries under British rule, 172 years ago. The observance of emancipation is an important part of nation building today for several reasons. President George Maxwell Richards in his Emancipation Day address to the nation said freedom is not a licence for disorder, particularly when it signals intimidation. Prime Minister Kamla Persad-Bissessar failed to attend an Emancipation Awards and dinner function last night where she was scheduled to give the feature address. Chairman of the United National Congress and Chaguanas West MP Austin Jack Warner says the people of Trinidad and Tobago must strengthen their resolve to reject all forms of discrimination and marginalisation as TT celebrates Emancipation Day today. I will remember Emancipation day for the rest of my life, you may ask yourself why , Emancipation day ,was the day my family THE GREENS were attacked IN BACOLET , , WE AS A FAMILY LOOK FOR RETRIBUTION DAY , WE WATCH AND WE WAIT , TO YOU WHO DID THIS CRIME , your time will come , you will be held accountable for this attack , we will never give up , you can run but not for ever , WE ARE RIGHT BEHIND YOU.